This paper presents a study of the influence of branching in the binary diffusion coefficients of n-heptane + n-hexane isomers, in the liquid state. The measurements have been made with the Taylor dispersion technique, at several compositions, at 283 and 298 K, for the X + n-heptane mixtures, where X= n-hexane, 3-methylpentane, 2, 3-dimethylbutane, and 2, 2-dimethylbutane. The results show a very interesting behavior of the composition dependence of the binary diffusion coefficients, presenting a maximum, for compositions about a molar fraction of n-heptane of 0.5, which increases with the increase in the degree of branching, suggesting the possibility of order-disorder effects caused by stereochemically favored packing in the liquid phase and energetically favored segment interaction in the liquid mixtures. An attempt to apply the van der Waals model to these data could not predict the experimental binary diffusion coefficients of these systems within the experimental accuracy. 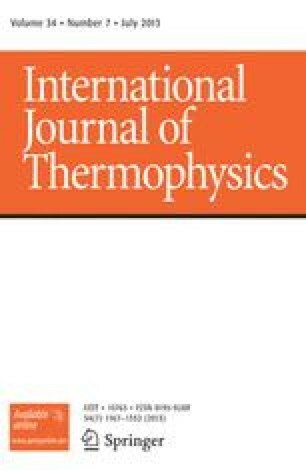 Paper presented at the Tenth Symposium on Thermophysical Properties, June 20–23, 1988, Gaithersburg, Maryland, U.S.A.